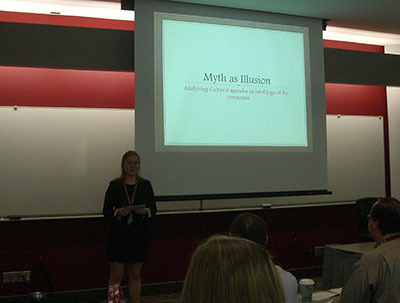 On April 17, 2014 the University of Alabama held its 7th annual Undergraduate Research and Creativity Conference which allows undergraduates, who are working with a faculty advisor, to present either a research paper or poster presentation. This year we had a few students from the Department presenting their research, and they did a fantastic job! 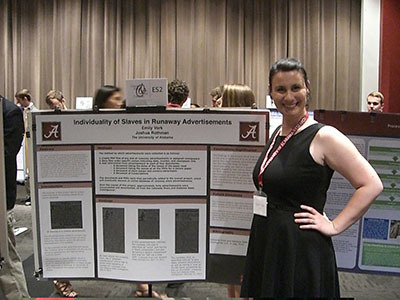 Emily Vork, a triple major in Religious Studies, History, and American Studies was presenting a research poster, “Individuality of Slaves in Runway Advertisement” for the History Department. 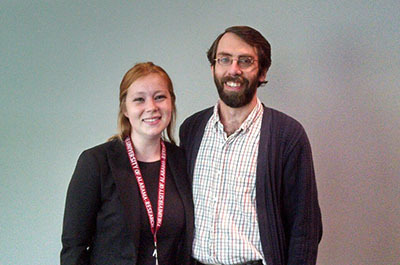 And Leighton Carlock, an English major, presented her “Myth as Illusion” research project that she’s been working on in her independent study with Dr. Ramey (pictured below with Leighton). Yesterday evening they announced this years winners, so congratulations to Leighton for receiving the award for International Focus (Humanities & Fine Arts)! And congratulations to Meghan Stallworth, an REL minor, for winning 1st place with her Psychology research in the Poster Presentation for Social Sciences! This entry was posted in Relevance of Humanities, Religion in Culture, Student Blog and tagged Emily Vork, Leighton Carlock, Meghan Stallworth, UA Undergraduate Research and Creativity Conference, Undergraduate Research by Andie Alexander. Bookmark the permalink.